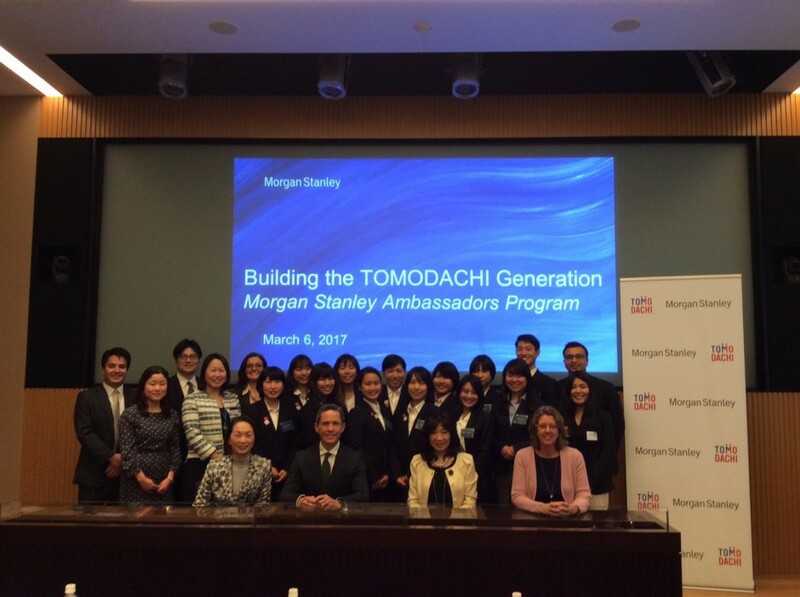 The Building the TOMODACHI Generation: Morgan Stanley Ambassadors Program successfully concluded in early March after two weeks of intense discussions on civil society. 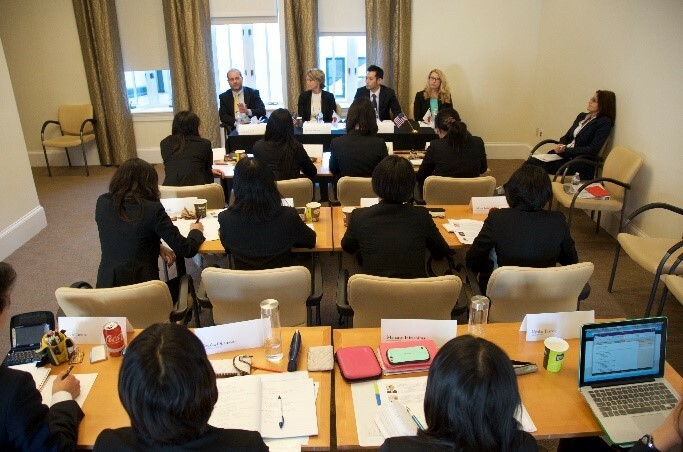 Generously funded by Morgan Stanley, this program was implemented in partnership between The Washington Center for Internships and Academic Seminars (TWC) and the U.S.-Japan Research Institute (USJI). The program aims to develop leadership and promote cultural exchange by learning about and developing models of cross-sector partnerships to address social challenges. This year, the program welcomed 21 college students (nine Americans and twelve Japanese), who participated in panel discussions and site visits, while enhancing critical teamwork skills and cross-cultural understanding. The program first began with the students studying theoretical and practical concepts of civil society through lectures and panel discussions. 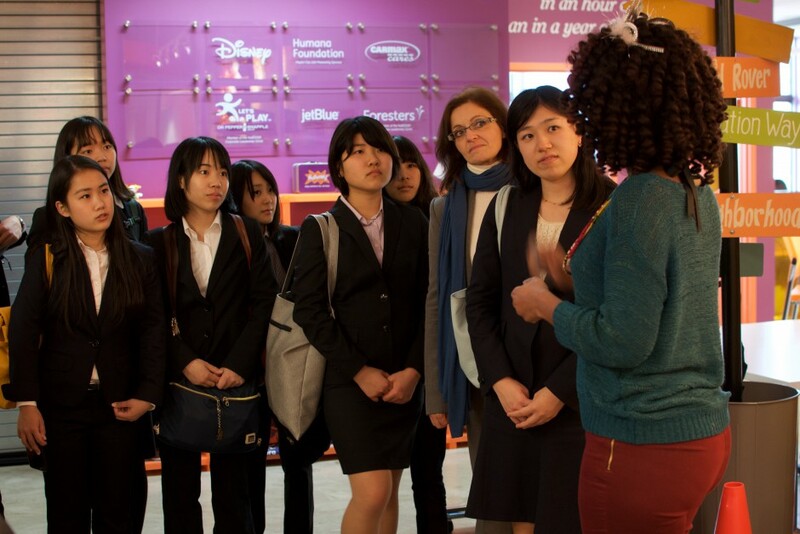 They learned about the role of civil society in both the U.S. and Japan, and how it can be utilized to address social issues, particularly those facing the Tohoku region. In the second part of the program, the students were divided into three teams and asked to develop a project that leverages the strengths of civil society to resolve persistent issues in the Tohoku region. The students directly applied the skills they learned to real-world issues and developed various ways to tackle them. For the final session of the TOMODACHI program, the three teams presented their respective projects to a panel of three judges at TWC’s Residential and Academic Facility. The judges included Laura Winthrop Abbott, formerly of the U.S.-Japan Council and the U.S. Department of State; Glen O’Gilvie of the Center for Nonprofit Advancement; and Katsuichi Uchida of the U.S.-Japan Research Institute. Team Mesa’s project received top honors at the event. Team Mesa envisioned establishing a business development center in Tamura, Fukushima, a town located about an hour away from the Fukushima Daiichi nuclear power plant that experienced a nuclear meltdown in 2011. Since then, economic development has stagnated in Tamura. To ameliorate this situation, the center would offer courses and seed funding to nurture technology startups, and provide a foundation for a sustainable small business community. The judges praised the other two teams as well; Team Mamagochi & Co. proposed creating an educational and social support network for youth displaced from their native Miyagi Prefecture due to the disaster. The network would help these young citizens manage stress, loneliness, and lack of self-confidence resulting from their displacement. Team Land of Rising Stars created a plan to increase farming and societal trust in agricultural products grown in Aizuwakamatsu, Fukushima. The proposal included collaborating with a local agricultural co-op to identify and tap into new markets for products, and partnering with local schools to combat concerns about the quality of produce grown in the area, which emerged following the nuclear disaster. 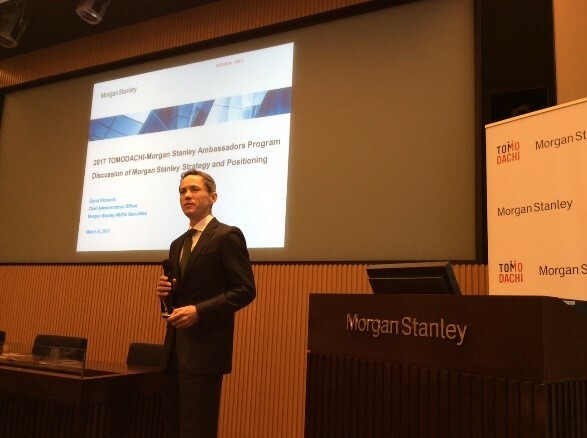 After returning to Japan, the students attended a debriefing session and a reception hosted by Morgan Stanley Japan Holdings Co., Ltd. In his remarks, Chief Administrative Officer David Richards talked about Morgan Stanley’s four core values: Putting Clients First, Doing the Right Thing, Leading with Exceptional Ideas, and Giving Back. The students then asked questions and had interactive discussions about these values during a Q&A session. With a new set of global skills applicable to their studies and careers, the students returned to each of their respective universities to further cultivate these skills and benefit others from their experiences in the program.